VOLUNTEERS WANTED FOR OCTOBER 6th & OCTOBER 7th! 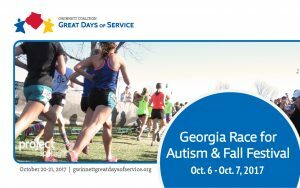 Join hundreds of enthusiastic volunteers as you MAKE A DIFFERENCE for Georgia Race for Autism and Fall Festival. There are four opportunities from race set-up, festival assistance, race assistance, and more! CLICK on the blue hyperlinks below to access the availability of positions AND to register via VolunteerGwinnett.net! RACE SET-UP Volunteers are needed on Friday October 6th, 2017 from 9 am till 1 pm to help set up for the Georgia Race and the Fall Festival. Lots of different things to help with: setting up, unloading, sorting t-shirts, assembling goody bags, race registration and lots more. This is an amazing event and you will be so glad you came! RACE SET-UP Volunteers are needed on Friday October 6th, 2017 from 4pm till 8 pm to help finish setting up for the Georgia Race and the Fall Festival. Lots of different things to help with: setting up, unloading, sorting t-shirts, assembling goody bags, race registration and lots more. This is an amazing event and you will be so glad you came! RACE DAY Volunteers needed on Saturday, October 7th, 2017 from 6.30 am until 10 am, SPECTRUM will be holding a 5K race and need 100 volunteers to help: man the race course, hand out water, help with registration, t-shirts, take photos, assist with timing, food, drink and much more. This is a great opportunity for all you early birds out there and this is an amazing cause. Sign up today! RACE FESTIVAL Volunteers needed on October 7th, 2017 from 10 am until 1 pm, SPECTRUM will be holding a Family Fall Festival and need 100 volunteers to help: man the activities, oversee kids area, hand out information and t-shirts, food, drink and then help with the clean up at the end of the event. This is a great opportunity for all you who want to help and this is an amazing cause. Sign up today! Don’t miss out! Sign up and make a difference today!